Things haven't gotten much more pleasant for the denizens of Utakata Village or the Shinju Forest. In fact, things are pretty much exactly the same as they were the first time around. The only difference here is the tragic twist of the queen assuming Princess Reco murdered her son Aki, and sending another of her sons, prince Palm, into the forest after her. It's kind of a bleak story when I really think about it. Although just like pretty much any shooter, the exposition takes a backseat to the action. 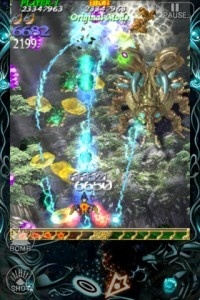 The action in this case being spread out over five stages, three game modes and four difficulties. And as expected, it's all glorious. Bug Princess 2 is essentially the same as the original Bug Princess. All of the expected variations are present and accounted for including Original, Manic, and Ultra Mode that each have different (and progressively more intense) bullet patterns. Likewise within each of those modes are four difficulty settings (Novice, Normal, Hard, and Hell), which will add even more projectiles to the screen as players move up the scale. A Score Attack mode is also present for leaderboard junkies. Where things truly differ are in the new levels (complete with new enemies and patterns) and second playable character (Palm and his dragon/dinosaur Hirow). I doubt it will surprise anyone to learn that Bug Princess 2 is every bit as solid of a SHMUP as its predecessor. The enemies, both the insectile Koju and the dinosaurs, are wonderfully designed and beautifully animated. Especially the bosses. And while Reco and Palm don't differ too much (both still just fly and shoot, really) they do have different strengths and weaknesses when it comes to their own ordinance. Neither one has an obvious advantage over the other, but giving players a choice is always appreciated. Being a Cave shooter, Bug Princess 2 is also prone to many of the typical "issues" as well. Most notably, while the visuals look great stylistically, they're still lacking the kind of sharpness one would expect in this the age of HD everything. Granted it is over 5 years-old at this point. Aside from that it's also quite tough. This should come as no surprise, obviously, but anyone looking for a casual shooter should probably keep their distance. Or at least give the Lite version of one of Cave's other iOS shooters a try first. Just to be on the safe side. Even though Bug Princess 2 is essentially "more of the same," I'm okay with that. Seeing as "the same" equates to an extremely responsive, intense, and downright fun iOS SHMUP I have a hard time viewing that as a bad thing. It might look a tad dated and lack some of the expanded modes of a few of Cave's other titles, but it's still awesome. So. Very. Awesome.